Pike Lake, the writer, is decidedly, unabashedly and irreversibly dead. Passing away in the late 1970's at the age of eighty-three, he attributed his demise, in a self-authored obituary scrivened shortly before his death, to an impacted bowel inflicted upon him by "television evangelists, feminists, warmed-over New Dealers, purveyors of shag carpet and other religious fanatics." Although enlightened ears may recoil at this appalling lack of sophistication, it must be acknowledged, albeit grudgingly, that we are all creatures of our own time. This work comes to us courtesy of his illegitimate grandson by a French barfly, Jean Baptiste Montcalm DeRemalade. Rummaging through the old man's belongings years after his death, M. DeRemalade discovered a box containing several unpublished manuscripts. Imagine his boundless joy! After twelve bitter years of estate litigation waged on three continents, Turner Junction represents the first of what is fervently hoped will be a long line of literary gems - each providing a healthy income to Pike's seemingly inexhaustible supply of grasping heirs. A devotee of nothing, an admirer of women's parts, a smoker, a drinker and a chafing irritant to all with whom he came into contact, such is the legacy of Pike Lake - and now there's this book. 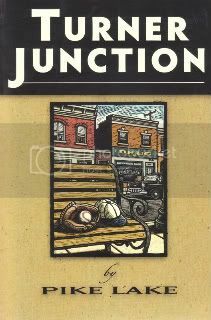 To order a copy of Turner Junction, please email turnerjunction@inil.com.